Ahead of her astonishing multimedia album, iPad 'App Suite' and performance residency, Dazed invites Björk to explore her influences in a special collaborative issue of Dazed, featuring some of the world’s leading scientists, creative technologists and musical pioneers — plus Björk herself! An intimate interview at her home in New York by Dazed editor Rod Stanley, discussing the three-year process that led to a project using new technology to bring the worlds of music and nature together. Exclusive fashion shoot with artist Sam Falls and stylist Katy England. Influenced by some of the varied ‘worlds’ of Björk’s project, such as DNA, viruses, and crystals, experimental and visually stunning shoots from Robbie Spencer & Richard Burbridge, and Katie Shillingford & Ruth Hogben. The designer at the head of the house of Yves Saint Laurent has created a crystalline dress for Björk, and discusses his ideas and inspirations. Artist Roger Hiorns discusses how he once coated an entire south London flat in blue copper-sulphate crystals. An interactive media artist, researcher and entrepreneur. He is one of the first artists to work with projector-based interactivity, and has worked with Björk on some of the key iPad apps in her upcoming Biophilia project. Drew Berry is one of the world’s foremost animators working in biomedical visualisation, animating the behaviour, dynamics and physical properties of DNA, bio-molecules and proteins. He has designed an app and created animation for Biophilia. An influence on Björk, Norman McLaren (1914 –1987) was a Scottish-born Canadian animator and film director known for his work for the National Film Board of Canada (NFB). McLaren was a pioneer in a number of areas of animation and filmmaking, including drawn on film animation, visual music, abstract film, pixilation and graphical sound. Two cutting-edge sound artists go head to head and discuss their work in volcanoes, tectonic activity and BASS. Henry Dagg is a sound sculptor who formerly worked as a sound engineer for the BBC. His works include a pin barrel harp or ‘sharpsichord’ which was commissioned for the English Folk Dance and Song Society, and a ‘cat organ’. 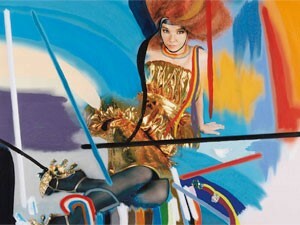 Björk has recorded a song with the sharpsichord. The MIT designer of robotic musical instruments reveals his thinking behind the creation of the giant pendulum harps in Björk's live show.